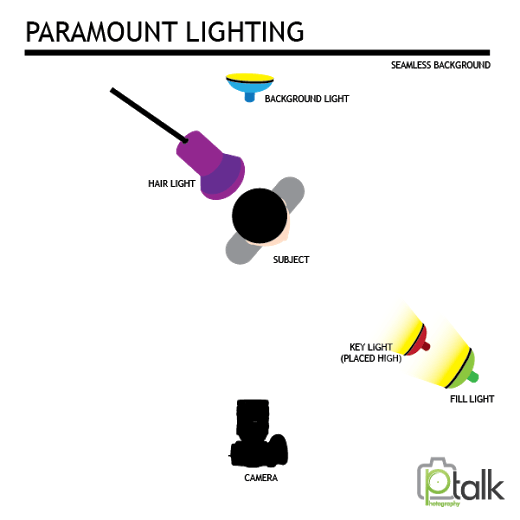 Moving on in our lighting setups series, we come to Paramount lighting. It is one of the most popular lighting styles and it is mainly used in fashion, glamour and classic portrait photography. It is also called glamour or butterfly lighting. Among its characteristics are the fact that it is a traditionally feminine setup and that it creates a butterfly-like shadow under the subject’s nose, hence the name. It works great for models with good skin and prominent cheekbones. 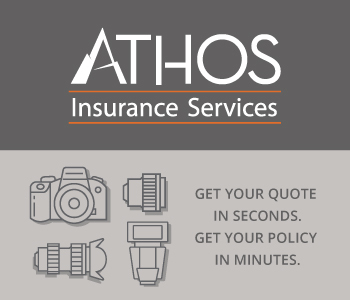 It is widely used by celebrity photographers, so it gives quite a common, yet spectacular look. Let’s have a look at the diagram. You will notice two things it has in common with Rembrandt lighting: the presence and position of the hair and background light. But we will get to those later. The main light, or key light, has to be placed in front of the model’s face, directly parallel to the vertical line of the nose. It also has to be placed high so that it will cast the trademark butterfly shadow. Subjects with deeper eye sockets might be disadvantaged by this type of lighting, as it will not show their eyes. The fill light has to be placed at the same height as the head, right under the key light. Because both the key and the fill light are on the same side of the camera, their effects should be countered with a reflector, placed on the opposite sides to fill the shadows from the neck and the opposite cheek. As usual, if you do not have a reflector with you, use any piece of white plastic or paper. The hair light usually goes opposite to the key light, and with Paramount lighting it’s no different. It should only influence the subject’s hair and not fall on the face or shoulders. The background light depends on the setting, but usually it is placed low behind the subject. It has to form a semicircle of light on the background in order for the tones to background to turn darker gradually, as you look farther from the subject. One more important thing to remember about Paramount lighting is that it’s not a scheme particularly suited for male models or masculine figures. It is intended to bring out feminine beauty and you probably wouldn’t want to use it for anything else. With that said, you should always experiment and adapt these classic lighting schemes to whatever you are doing. Don’t settle for the rulebook, make it your own.